Honestly, I have no idea why the two losers were even still alive in the Rider-Waite version. It makes more sense for them to be dead right? When you loose a sword fight, you are dead. Also the Rakasha’s alter-ego was the blind knife thrower at the carnaval so I’ve made the swords into throwing knives. 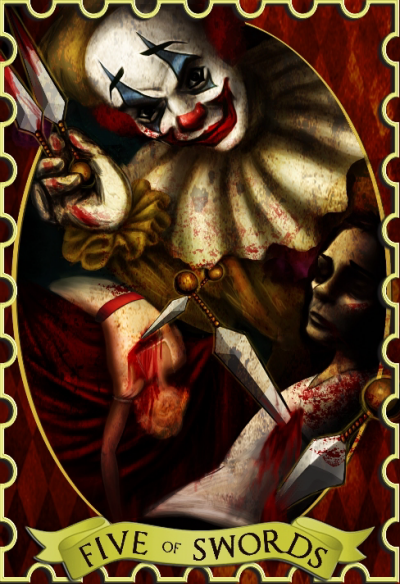 Quote from Super-wiki: In 2.02 Everybody Loves a Clown, the Rakshasa is disguised as the blind knife thrower who works with the circus. It appears to children as a clown, and when they invite it into their home it kills their parents. Bobby tells them the creature can be killed with a knife of pure brass. As it pursues them, Sam manages to kill the Rakshasa with a brass pipe from the organ in the funhouse.